As an e-commerce store accepting cryptocurrency, you’ve already jumped over the hurdle of collecting it. Perhaps you did it for marketing reasons, or to be prepared if crypto became mainstream. What you didn’t expect was people to pay you in it right now. So, what should you do with your store’s cryptocurrency? Below, I’ll talk about the current security risks cryptocurrency faces and the different storage options e-commerce owners should know. Crypto exchanges have become breeding grounds for online criminal activity for various reasons. To start, exchanging and storing cryptocurrency is still in its infancy, so there’s a general lack of understanding around the best practices to keep coins safe. Additionally, these exchanges often have weak security measures. Government regulation has also been limited to-date, meaning very few enforced safety regulations for users. The lack of these regulatory mechanisms means less red tape for criminals to have to work around. Finally, there’s widespread use of unsecured wallets, which can mean more opportunity for online theft. So, why stay away from an online wallet? Online wallets—also called ‘hot wallets’—are, as you’d expect, always connected to the internet. These wallets are useful for holding small amounts of money for short periods of time. For example, if you sell cosmetics from home and your daily transaction volume is relatively small but stable, an online wallet makes a lot of sense. However, because these wallets are constantly connected to the internet, they’re more susceptible to attacks. For example, in 2015, Bitfinex, a large exchange provider, had over $65M stolen in a hack. Theft is not a rare occurrence; there have been over 980,000 Bitcoins stolen from currency exchanges since its conception, totaling over $15 billion in value. Bitfinex is merely an example, though. Any cryptocurrency wallet on the internet carries vulnerabilities. Now that we understand how unsafe it is to store coins online, what are your other options? Desktop wallets allow you to store your cryptocurrency on your computer, but without the need to be connected to the internet. These wallets operate by downloading your blockchain history onto your computer. Mobile wallets work similarly, but sometimes with the added benefit of NFC capabilities to enable secure payment. Desktop and mobile wallets shine for their ease of access, but it’s also one of their biggest downfalls. Your devices are still susceptible to other types of malicious activity, such as keylogger malware that criminals use to crack your private keys. To be even more secure, you’d need to disconnect your wallet altogether. Enter: the world of hardware wallets. Surprisingly, the more advanced the security system for storing cryptocurrency, the more straightforward. A hardware wallet consists of two parts—a connected and disconnected device. The connected wallet contains your public key and allows you to store your cryptocurrency. It can only be activated, however, when connected to the offline device which holds the private key. This type of wallet isn’t susceptible to the same attacks as online wallets, because it requires the actual physical device to be present. But which hardware wallet is the best one? There are several leading choices that users prefer based on different features. I’ll cover two popular options below. The Treznor wallet was the first Bitcoin hardware wallet on the market. It’s sleek, easy to use, and well-reviewed. Treznor connects via your USB port, but won’t transfer data without a 9-digit pin entered on the Treznor’s screen. The pin is randomized to ensure security should your computer get hacked. Additionally, the system asks for a 24-word seed to be created for data recovery if the device is misplaced. With over 1 million sold, the Ledger Nano is up there with the Treznor wallet concerning security. Unlike the Treznor, the Nano has no battery and can only power on when connected to a PC. When booted, the Nano uses a cryptographic procedure to check its connected device for any security breaches. It also features an OLED screen and is configured with a pin and 24-word recovery seed. Ironically, the best way to keep your cryptocurrency safe may be simple paper. Although hardware wallets do their best to provide a technologically secure place to store your crypto assets, they’re not immune to theft. By printing off your wallet, your keys aren’t digitally stored anywhere, making them completely safe from hackers. To create a paper wallet, you might try BitAddress.org, a secure open source wallet generator. The only downsides of a paper wallet are the degradation of the ink over time and their susceptibility to the elements. Paper wallets should be laminated and stored in a secure location. You may want to print a few backups to save in other places as well. 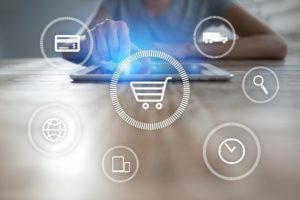 As an e-commerce business new to the world of cryptocurrencies, deciding what you should do with your store’s cryptocurrency may be overwhelming. However, many storage options exist given crypto’s popularity. But, as covered above, not all options are equal. Doing your research and spending the time to safeguard your cryptos correctly may seem strange and a little extreme but will be worth it for your peace of mind.